Volunteer Kim Martinez makes a point to “Art Positive!” workshop attendees. If you think Art Access is just a gallery, you’re missing more than just the boat; you’re missing the whole armada! The downtown Salt Lake gallery is just the most visible part of a progressive, civic-minded organization that is much, much larger. In fact, the organization’s best work is not even the art they show, but the various processes that lead to it! I’ll explain, but first it’s important to establish that they are actually ‘Art Access/VSA Arts of Utah’, the Utah affiliate of VSA arts (www.vsarts.org), an international, nonprofit organization founded by Jean Kennedy Smith in 1974 as an affiliate of The John F. Kennedy Center for the Performing Arts. Arts Unlimited is an exhibit of artwork by adults with disabilities throughout the state. Artwork is collected year-round and the exhibit is made available to organizations on a rotating basis. 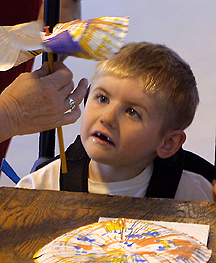 The Art Access Gallery showcases the talents of artists, with and without disabilities. For the artists who participate in its exhibits and programs, the gallery provides a pathway into the mainstream of the arts community. Through the opportunity to exhibit and sell their art, the artists are recognized for their abilities, not their disabilities. The Artist Residency Programs for the Schools serves children all over the state who receive special education services. The program allows children an opportunity to experience success and thus to be more successfully integrated into the life of the school. It is in collaboration with the Utah State Office of Education: Special Education Services Unit. 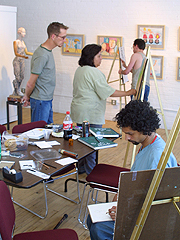 Another residency program, the Artist Residency Program for Adults serves adults with disabilities. Artists provide visual arts, dance and movement and music workshops to adults residing in nursing homes, using services of independent living centers, or receiving services dealing with substance abuse or mental health issues. The Literary Arts Program provides literary workshops for adults with mental and physical disabilities to help them express their point of view, both in writing and visually. Workshops provide the resources for publication in Desert Wanderings Magazine and published writers receive a stipend for the use of their work. Under the Olympic/Paralympic Cultural Arts Project and during the 2002 Winter Games in Salt Lake City, the Art Access Gallery presented Women Beyond Borders and an exhibit featuring the Brian and Joe Show, a collaborative work of a professional artist and his friend who has Down syndrome. A third exhibit was Children Beyond Borders, featuring the box art of children with disabilities from the international network of VSA arts. Each year, the Visual Artist Mentoring Program (PARTNERS) program identifies adults with disabilities who for a variety of reasons desire assistance with their artistic development and matches them one-on-one with a professional artist mentor. The program annually culminates with an exhibit in the Art Access Gallery, which showcases both the work of emerging artists and their mentors. A series of Teen Visual Arts Workshops in the Art Access Gallery provides teens with and without disabilities with opportunity to learn about new art mediums. Artists are chosen from the gallery schedule to teach the workshops during the time that their art is being shown. While engaging in the creative process, participants also learn to appreciate each other’s differences and abilities. The program culminates in a juried exhibition in the Art Access Gallery. Offered on Saturdays at the Art Access Gallery, the Adult Visual Arts Workshops are open to adults with and without disabilities. Professional artists conduct intensive 8-hour workshops in the fall and winter for groups of 20 at a minimal fee. Artists participating in the Partners mentoring program can attend these ‘continuing education’ workshops at no charge. Finally, Art Positive! 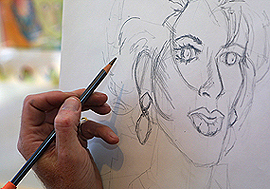 Is a program that provides Saturday workshops at the Art Access Gallery for adults living with HIV/AIDS. A collaborative project with the Utah Arts Council Arts Education and with support from the Utah AIDS Foundation, the People with Aids Coalition Program and the State Health Department, the program is free and offers participants free art supplies and instruction by professional artists and culminates in an exhibition of participants’artwork. In addition to these programs based on the visual arts, Art Access/VSA Arts of Utah also offers a number of other outstanding programs and resources, including their Resource/Reference Center, Hospital Arts Service Program, Educator Incentive Awards, New Visions Dance Project and their semi-annual newsletter. So there you have it. You can visit the Art Access Gallery and just enjoy the artwork, like I’ve been doing for quite some time. Since art is all about emotion and expression, certainly the work of their artists is compelling. Or you can explore a little deeper and really be enriched. You can learn more about the process behind the art, about the programs that generate the art, about the artists and their issues. You can accept the challenge that their art makes to look beyond yourself and celebrate the diversity around you. And if you are uplifted and motivated by the Art Access/VSA Arts of Utah beliefs in acceptance and inclusion, and their diligent efforts to back it all up, you may even decide to support them. They employ artists at $30 per hour and are always in need of professional artists with experience working with people who have mental or physical disabilities or youth at-risk. While their interest is statewide, they especially need artists in rural Utah to apply to the roster of literary arts, dance/movement, visual arts, and music. If you have Adobe Reader, you can view and print the Application Form here. 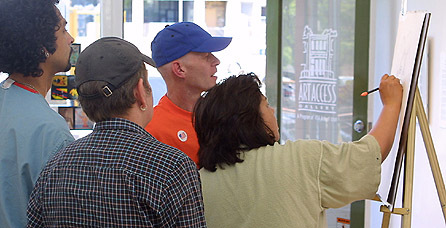 The Art Access Gallery is located at 339 West Pierpont Avenue in Salt Lake City. You can call them at 801-328-0703 (voice/TTY) or send a fax to 801-328-9868.